We all need a rest periodically, yes? For some, that means taking a break from ongoing family responsibilities—leaving the kids with a sitter for a few hours, perhaps, so you can go out for coffee with your spouse or a good friend. For others, it means taking an extended vacation away from workplace pressures. For some, it means turning off the cell phone and ignoring social media for a day or two. Your circumstances and life season will determine your need for renewal and what that looks like in practical terms. For me, today, taking a rest means spending an extended time with my Bible and journal. I’ve sipped coffee and read a couple chapters of a good book. After posting this blog, I’ll give the boat a good clean. I know, I know—that doesn’t sound like a rest, but I find a change of activity is good for the soul. Besides, I’ve been staring at winter’s salt residue on the steps entering the salon long enough. I look forward to doing a bit of spring cleaning, and I’ll make it fun by listening to praise and worship music while I scrub. When I’ve finished that task, I’ll schedule memes for my FB Author Page and then go for a walk. Tomorrow morning I’ll be good-to-go and better able to focus on preparing for upcoming speaking engagements. “Rest” looks different for everyone, but one thing’s for sure—we need it. And we need to enjoy it without feeling guilty. God knows we’re not super-human. We’re made from dust, and we flourish best when we take occasional breaks from routine busyness. What does “rest” look like for you? Thank you for your ministry. I looked you up when I noticed you were the author of today’s First 5 devotional. Your posts on rest, letting go, and how you made the transition to live on the sailboat were inspirational and timely. I prayed for you but was at a loss for how, so I thought you might be able to address my question. How do you pray for someone when you know God is in charge of the plan? What do you request? Since He made the plan, He is in charge – He will keep you safe, and your ministry will be guided by Him to reach those He desires. So, to pray for those types of things doesn’t make sense. I did pray for your family and your peace of mind as you embark on this journey, but that is all that came to me. So, the big question is how to pray when we know God is in control of a situation? I realize He is always in control, but He gave us free will, and for those not following Him, my prayer is to soften their hearts. In your case, as in others whose free will seems to be following after Him, His plan seems to be set in motion for His purpose. He knows His plan, so for me to pray regarding His plan doesn’t make sense to me. I apologize for the lengthy message, but his was on my heart to ask. Can you help to enlighten me? First, thank you for praying for me and my family. That’s very special. Praying for our peace of mind as we live in this place is absolutely right on. So many things could cause concern — costly repairs for the boat, developing meaningful relationships with our neighbors, how to best use the boat as a ministry tool, my husband’s one-hour commute to and from our ministry office when the price of gas is the most expensive in all of North America, and more. 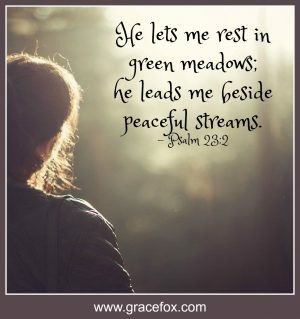 Peace of mind over all these potential concerns will help keep me content and stress-free, and a more effective testimony to the power of God in my life. So what other things can you pray for people who are following God and cooperating with His unfolding plan for their lives? * Pray for an ever-growing love for God’s Word. * Pray for the ability to identify the enemy’s lies before they take root in their thoughts. * Pray for the attitude of humility. * Pray for their ability to give thanks in all circumstances. * Pray for harmony in their homes, the ability to forgive their offenders, for generous hearts. As you read through Scripture, ask the Holy Spirit to open your eyes to see words you can pray. I don’t fully understand why God sometimes waits to act until we pray, but He does, so prayer matters. Never doubt the importance of whatever prayer He puts on your heart for someone who loves Him.